Gesturing is such an integral yet unconscious part of communication that we are mostly oblivious to it. But if you observe anyone in conversation, you are likely to see his or her fingers, hands, and arms in some form of spontaneous motion. Why? 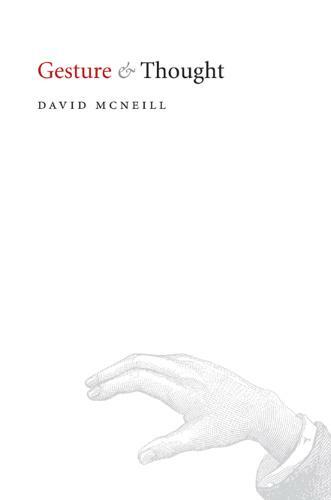 David McNeill, a pioneer in the ongoing study of the relationship between gesture and language, set about answering this question in "Gesture and Thought" with an unlikely accomplice - Tweety Bird. McNeill argues that gestures are active participants in both speaking and thinking. He posits that gestures are key ingredients in an "imagery-language dialectic" that fuels speech and thought; gestures are the "imagery" and also the components of "language," rather than mere consequences. The smallest unit of this dialectic is the "growth point," a snapshot of an utterance at its beginning psychological stage. Enter Tweety Bird. In "Gesture and Thought", the central growth point comes from a cartoon. In his quest to eat Tweety Bird, Sylvester the cat first scales the outside of a rain gutter to reach his prey. Unsuccessful, he makes a second attempt by climbing up the inside of the gutter. Tweety, however, drops a bowling ball down the gutter; Sylvester swallows the ball. Over the course of twenty-five years, McNeill showed this cartoon to numerous subjects who spoke a variety of languages. A fascinating pattern emerged. Those who remembered the exact sequence of the cartoon while retelling it all used the same gesture to describe Sylvester's position inside the gutter. Those who forgot, in the retelling, that Sylvester had first climbed the outside of the gutter did not use this gesture at all. Thus that gesture becomes part of the "growth point" - the building block of language and thought. An ambitious project in the ongoing study of the relationship of how we communicate and its connection to thought, "Gesture and Thought" is a work of such consequence that it will influence all subsequent linguistic and evolutionary theory on the subject.